A little bit of organization in your tack trunk so you can easily put your hands on any item can make show day a lot less stressful. It’s a new year, so you are full of ideas, shows on the calendar, and inspirational training ideas. It’s also January, so if you’re not lucky enough to be in Florida or California, it’s cold outside, and some days are just too cold/wet/snowy/icy/icky to do anything with your horse besides pet him on the nose. Consider this the perfect time to use your energy organizing your “stuff” for the upcoming year! Liv Gude of Pro Equine Grooms has a plan of attack for you. Tack trunks are a great place to start. Most tack trunks start out clearly organized, and then you start using the stuff in it. You will inevitably burrow to the bottom looking for the one item that was actually really close to the top. Over a span of mere days, you can end up with a “tossed salad” sort of effect. Remove everything and group your items into categories. 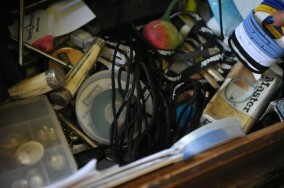 Leg protection, medications, bits and spurs, brushes, grooming products, rider items like gloves, socks, etc. Alternatively, you could group your items into things you use daily, back-ups, and rarely used items. You may only have a few categories, or you have so many categories that you invent your own horse dewey decimal system. Don’t forget to have a discard pile. If you have seasonal items, like coolers, you may like to have a separate container for winter- or summer-only items. Clean and inspect everything. Spare bits of leather should be cleaned, oiled, and have the stitching examined for safety. Medications need to be checked for proper storage temperatures and expiration dates. Anything that can be laundered can be whisked away to the washer. Wipe the dust from everything, and use your horse vacuum to remove all dust from the inside of your trunk. Place your newly cleaned items into smaller containers or bins to stack within your tack trunk. Labeling these smaller bins is also a good idea, unless you have x-ray vision, in which case you should get your own superhero movie. Line the bottom of your tack trunk with the bins of rarely used items. Rarely used items are also a good idea to store in your trailer, on the top shelf in the extra miscellaneous storage area, or at home. This creates an easier space to manage in your tack trunk. For everyday items, you may want a bin or container that doesn’t have a lid, so that you can easily grab your gloves or spurs. Using labels, bins, containers, and magic markers of a wild and unique color will make your items easy to see and recognize. Using really ugly colors may also be a theft deterrent, especially at shows! For really large items that need labels, you can go to a home improvement center and get giant address letters to label the big and important items. These are usually reflective, so you get some bling as a bonus! Consolidate all of your tack cleaning supplies. Now is a great time to replace questionable sponges and scrub out that bit bucket that gets used for dunking bits. It’s also a great time to take apart your bridles for a deep cleaning and possible oiling. A toothbrush makes a handy tool to get rid of the goo that can collect in the buckles and keepers. Inevitably, you will have some items that are no longer used, or items that were replaced with new and shiny versions over the holidays. If you end up with a discard pile, consider planning a tack swap with your barn mates. You can also sell your items online, or consider donating your items to a local horse rescue or therapeutic riding center. Once you have an organizational plan in place, you can apply it all over the barn! Attack your trailer’s tack room with a similar method. It’s important when you are in the trailer to remove all items and inspect any wiring you may see, check for rust, and test all of the lights. As you replace your items, plan on also securing them so they don’t bang, tip over, or spill as you cruise down the road. For a trailer tack room that stores a lot of extra stuff, consider investing in a sturdy set of storage drawers to hold the smaller items. When you get to the feed room, pay particular attention to a few things. When sweeping, dusting, and cleaning, look for rodent droppings. This is a sign your containers are not suitable, and/or you have spills. Move and inspect all of your bins and containers. This is also a great time to check expiration dates, put labels on containers, and toss items that are no longer needed. The smaller containers could be repurposed in your tack trunk or sent off to the recyclables. Organizing your horse supplies doesn’t have to be a daunting task—label everything, clean everything, and do a little bit at a time. Who knows—you may find that long lost whooziemagidget! Curious what’s in top hunter rider Amanda Steege’s tack trunk? Check out the Jan. 13 issue of The Chronicle of the Horse for a peek at her essentials and sentimental items.